Learn how to make these under bed storage boxes to maximize space in a small bedroom. 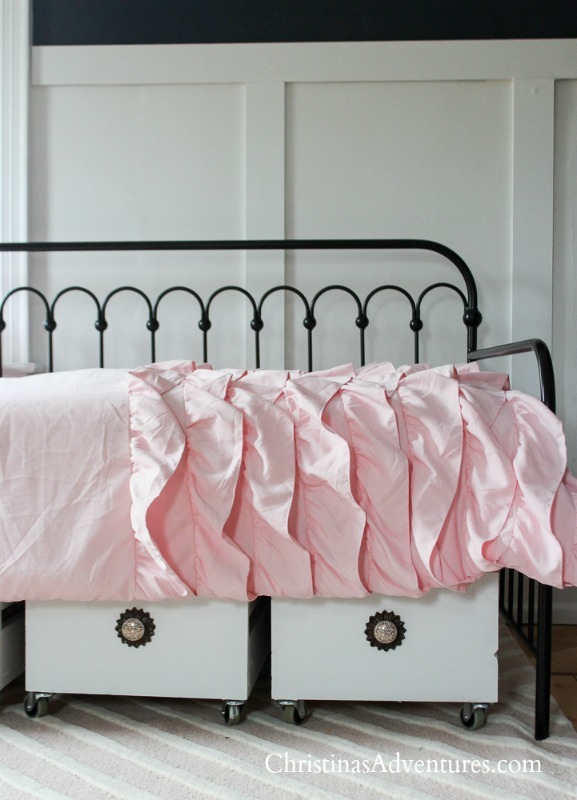 They’re an easy DIY project that doesn’t require fancy equipment! This post contains affiliate links- full disclosure here. If you’ve been following along on Instagram, you’ve probably seen lots of sneak peeks in my stories about how we’re transitioning my son’s room to a shared room for my son and daughter while we prepare for the new baby. I was looking for a dresser everywhere that was low budget and also gave us the storage space we needed – no luck. 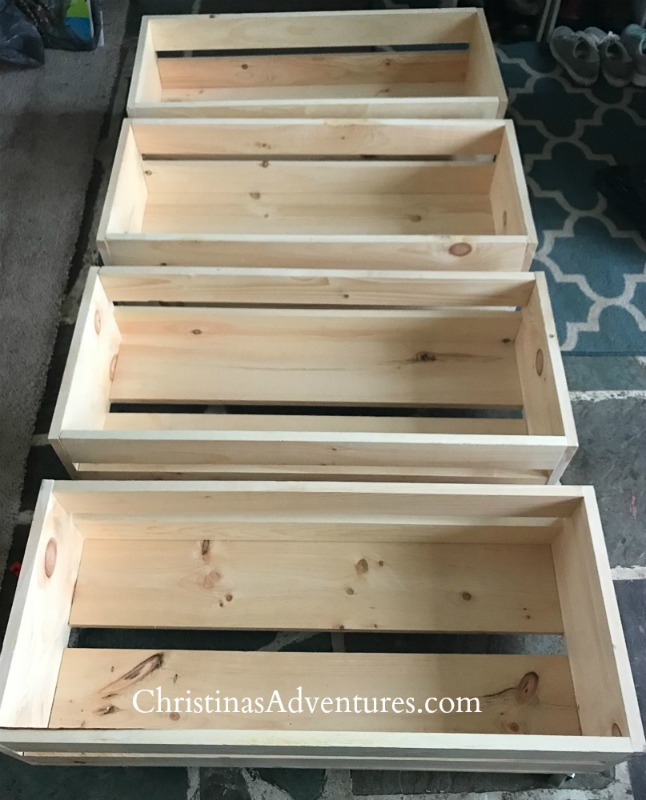 We decided to take matters into our own hands and made some under bed storage boxes – and I love them so much! we got ours at the hardware store, but these are a better price & have great reviews! Before you begin – make sure you measure the space under your bed. 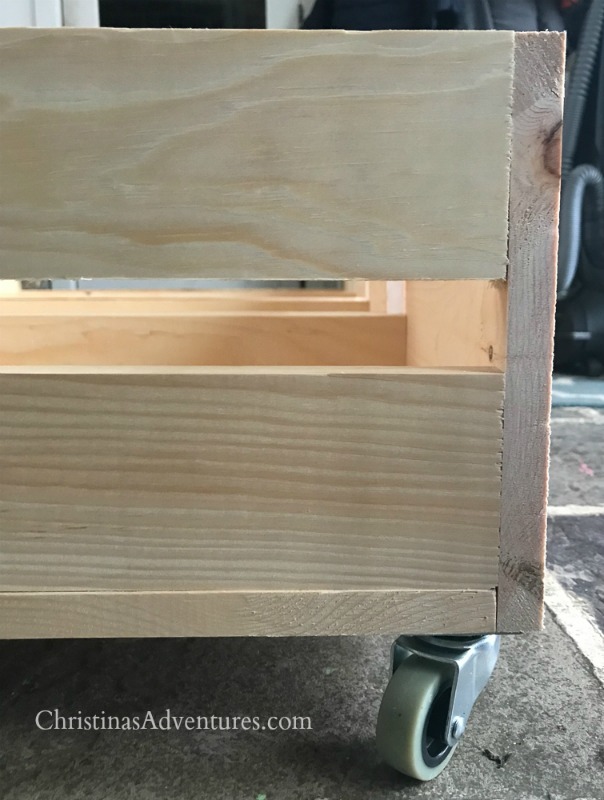 My daughter’s bed is a trundle bed, and we took out the trundle part underneath to put in these under bed storage boxes We left a few inches of clearance at the top and on the sides – we didn’t want the drawers scraping together or against the sides or top of the bed. 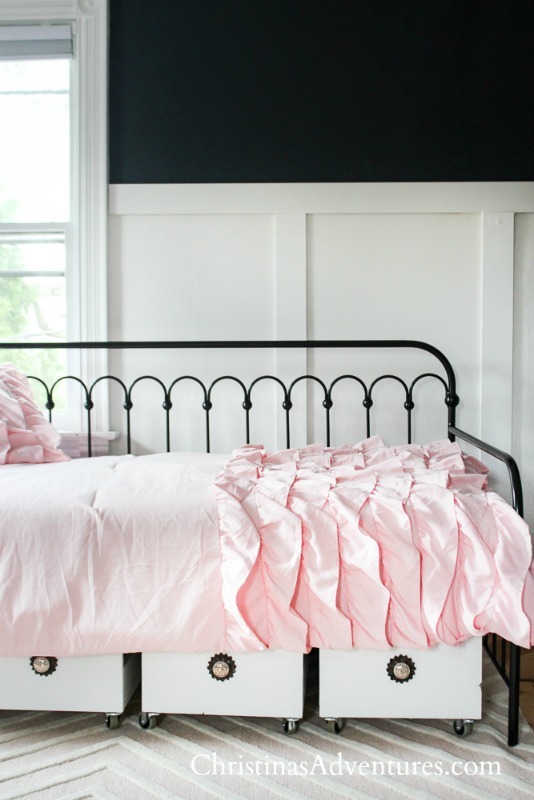 Shop her bed here – we love it! While you can make these more complicated, we chose to keep the design simple and functional. We did no fancy mitered cuts, no pocket holes, etc. You can see in the picture below how we simply butted the pieces of wood against each other and put screws in from the sides. 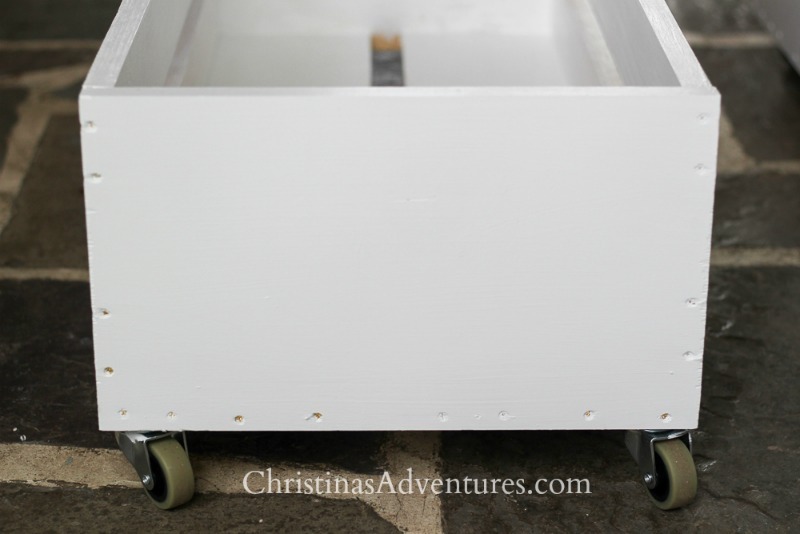 We added these caster wheels to the bottom – one in each corner, so four total on each box. We made four boxes to go under the whole bed. Then the easy and fun part! Fill holes with wood filler (I forgot to do mine until I did a coat of paint – whoops), sand and paint! You could also spray paint the caster wheels a fun color if you’re feeling creative! Add the hardware – this is the fun part! You could go with standard black pulls, go with something a little more colorful, or whatever else matches your style and the room! I like the weight that the back plates give the knobs on these drawers. 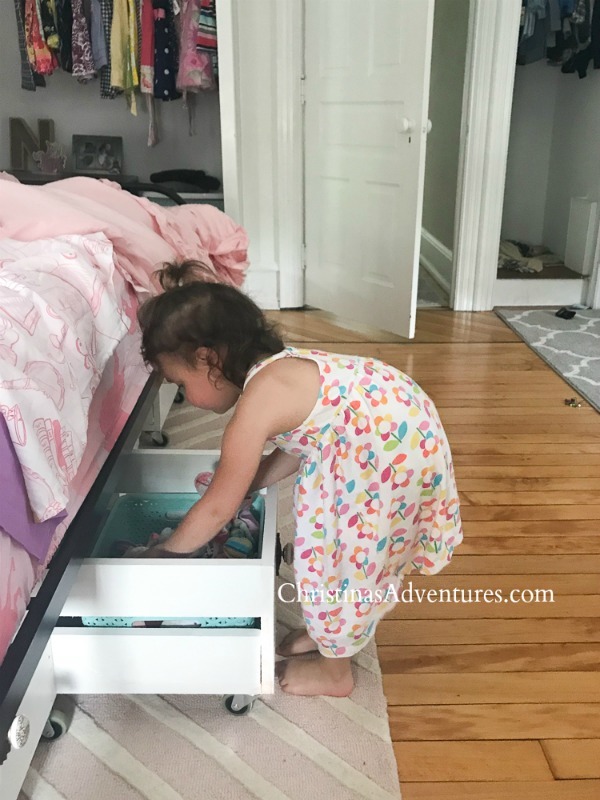 Since these drawers are big, and Nora’s clothes are so little, we decided it might help to add one basket inside each of the boxes. These baskets fit perfectly! We kept little things in them (underwear, socks, shorts, etc.) and have them at the front of each drawer. Also? 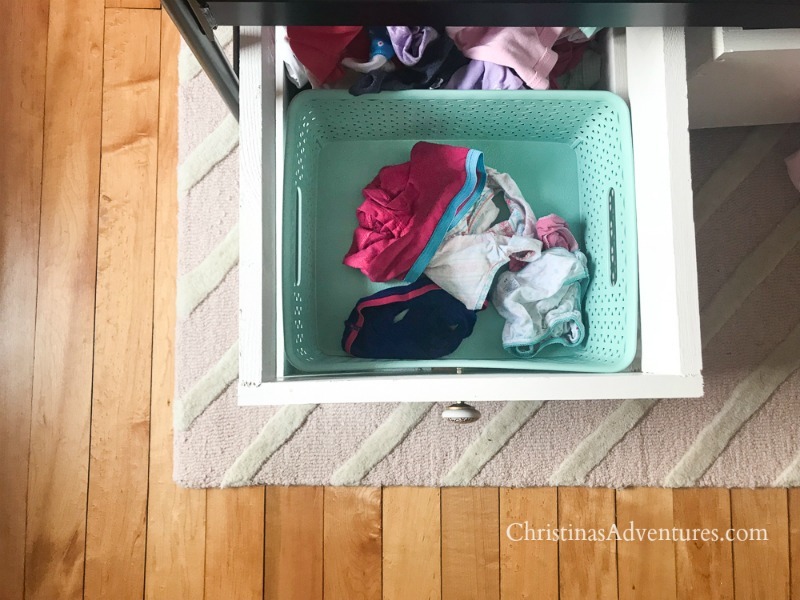 They’re really easy for Nora to access and she’s now able to put her laundry away (with help of course) when she wasn’t able to do that before because her drawers were too high. Win win! We really love how these turned out and we’re really glad we decided to DIY this project! If you liked this tutorial for building under bed storage drawers, please pin it here to save it for later and share it with others! I was worried about the gap in the middle of the boards when we first made them. 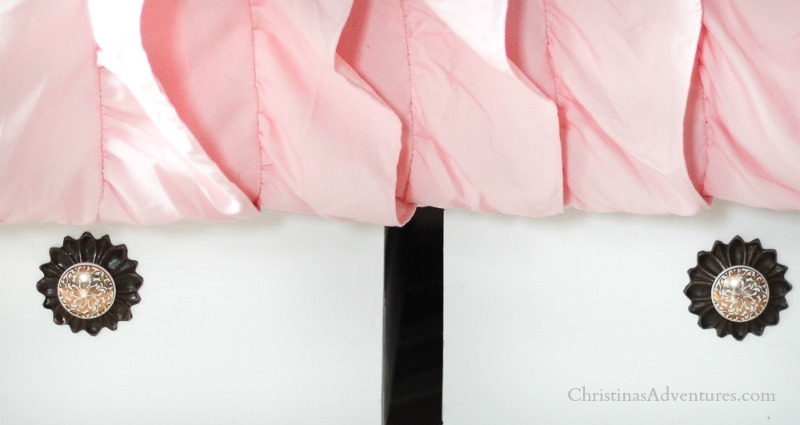 I planned on using cardboard covered in pretty fabric to make cute “liners” on the bottoms, but I haven’t done so yet. No clothes have fallen out! But you could absolutely adjust your measurements so you have a closed bottom on your boxes. These are heavy! Not too heavy that our daughter can’t pull them in and out though thankfully. But just so you know, they’re going to be solid wood heavy pieces for under the bed. Knobs OR pulls would work really well with these – just a matter of personal preference! Love these. I wish I had that kind of room under our beds. Thanks for sharing the designs.